Home > Cars, Railroads, Ships > Railroads - Company names from P - Z > Union Line Express 1856 - Mansfield, Richland County, Ohio. 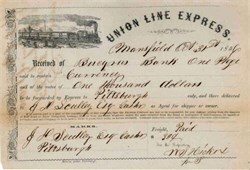 Beautifully engraved receipt for transporting $1,000 from Mansfield to Pittsburgh from the Union Line Express issued in 1856. This historic document has an ornate border around it with a vignette of a train. This item is hand signed and is over 147 years old.